Home > Horse News > Equine Industry > Horseback Riding while Pregnant: Yes or No? Riding your horse while pregnant - should you do it? Over the years, many women have asked me, “Is it ok to exercise, as well as ride my horse during pregnancy?” Many expectant mothers have pondered this question, debating whether they continue riding while pregnant or not. Although some physicians believe pre-natal exercise may cause miscarriages or premature delivery, most studies have not demonstrated or supported this belief. In fact, the American College of Obstetrics and Gynecology, and the American Society of Obstetrics and Gynecology, both recommend that healthy women continue their exercise programs during their pregnancies. Pregnancy is a normal physiological state, where both mother and fetus grow and develop. Physical activity, during pregnancy, benefits the expectant mother and fetus, playing a role in maternal fitness, controlling weight gain, and accelerating post pregnancy recuperation. On the flip side, however, controversy surrounds participation in certain high-risk sports, including horseback riding, where the chances of falling or trauma are high. Horseback riding isn’t the only potentially dangerous sport. Others include ice hockey, soccer, skiing, and scuba diving. All of these activities can cause serious injury to both the mother and fetus if an accident occurs. Without a doubt, women first need to talk to their doctors about how much, and what type of exercise, is right for them, depending on their current health, and personal risks associated with exercising while pregnant. In rare cases, a physician may not recommend pre or postnatal exercise, depending on the health of the mother. However, most pregnant women can, and do, exercise safely right through their first trimester. The American College of Obstetricians and Gynecologists recommend women, who have been cleared by their physicians, to engage in at least 30 minutes of moderate intensity physical activity on most, if not all days of the week. Exercises such as walking, swimming, cycling, and aerobics are, by and large, safe for beginners, whereas running, strength training and racquet sports are allowed in moderation. Pregnant mothers who previously participated in these sports are allowed to safely continue. Keep in mind that some studies have demonstrated that strenuous activities may be associated with pregnancy complications so always check with your doctor for clearance prior to engaging in any exercise program. There is a range of both physical, and emotional, benefits of exercising while pregnant. They include the following: increased energy, reduced back pain, improved circulation, relief from leg cramps, swollen hands/feet, and constipation, as well as, helping to avoid excessive weight gain. The first trimester is a time of immense physiological changes for both mother and fetus. During this time the fetus undergoes incredible growth of both organs and limbs. The mother’s blood vessels expand, her uterus enlarges and she gains upwards of ten pounds. Towards the end of the first trimester, all expectant mothers must avoid exercises that require lying supine on their backs to prevent a decrease in blood flow and dizziness upon rising. During the second trimester, both expectant mother and child, continue to experience dramatic physical changes. Women can expect to gain 22-35 pounds around their abdomens and pelvis, accompanied by fatigue and loss of energy. This weight gain seriously alters body posture, balance, coordination and one’s center of gravity. At this time, an exercise that requires agility, suppleness and flexibility also becomes more difficult. Exercise programs, therefore, need modification taking into consideration the risk of abdominal injury. Exercising supine or in a prone position need to be avoided. Aquatic exercises are recommended at this time. Pre-natal exercise programs require several important considerations. Remember women gain between 25-40 pounds during their pregnancies. This excess weight will necessitate increased caution due to one’s body alignment, balance, posture, reduced strength and endurance, as well as placing stress on joints, ligaments and muscles. Weight gain will also place more stress on the cardiovascular system. Expectant mothers engaging in regular exercise also need to remain well hydrated to avoid large increases in body temperature and avoid exercising in hot, humid environments. This will prevent the risk of heat stress, especially during their first trimester. 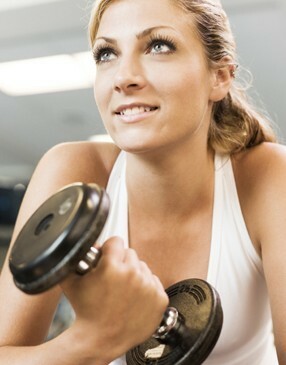 Remember that physically fit women will regulate their core temperatures more efficiently than a sedentary woman. It’s also important that expectant moms wear loose fitting, comfortable workout clothes that do not restrict body movement. Lastly, pregnant women need to avoid both high and/or low air pressure environments while exercising. Higher altitudes are dangerous due to decreased oxygen levels, just as water sports, such as deep-sea diving need to be avoided due to the high pressure placed on the body. During pregnancy, one’s calorie needs are variable depending on their activity level, general health, and well-being. Expectant women should always check with their physicians concerning their individual nutritional requirements. Small, frequent meals and regular fluid intake are generally advised to ensure stable blood sugar levels and proper hydration. During the 2nd and third trimesters, sedentary pregnant women require 3,000 calories per day. If physically active, your caloric needs also increase. The American College of Sports Medicine (ACSM) recommends that pregnant women do not exceed pre-pregnancy levels of exercise. Avoid intense competitions and only exercise moderately in sports/activities you participated in prior to becoming pregnant. Both weight bearing and non-weight bearing exercise are allowed as long as the participant remains comfortable. Heavyweight lifting is NOT recommended due to the increased strain involved in strength training. Safe modes of exercise include; walking, light jogging, cycling, and low impact aerobics. It is advisable to avoid biking during the 2nd and 3rd trimesters because balance and stability are compromised placing expectant mothers at risk for falls. Along with the ACSM, The American Pregnancy Association also lists, stair climbing, yoga, and dance as acceptable forms of exercise for pregnant women. Horseback riding, skiing, and water skiing are to be avoided due to the risk of falls, and serious injury. Remember that you are exercising for two! Stop exercising if you experience any of the following and call your doctor immediately! Recent research demonstrates that engaging in strenuous activity may adversely impact pregnancy. Pregnancy causes both ligaments and tendons to soften, and as a result, they lose their normal strength and stability. As pregnancy advances, expectant mothers may lose their sense of balance, good body mechanics, and center of gravity, as well as gain considerable weight. When your center of gravity changes the ability to safely ride a horse is greatly diminished increasing the risk of falls, miscarriage, and broken bones. Continuing to ride through pregnancy is a difficult and personal decision that only the expectant mom and her OBGYN can make. Some physicians recommend never riding a horse when pregnant while others suggest it’s ok, but only if the expectant mother has been riding regularly prior to getting pregnant. Most OBGYN’s advice riding up until 12 weeks then STOP. Because at 12 weeks the fetus has repositioned itself above the pelvic girdle. The fetus is no longer protected by the bony structure of the pelvis and is now vulnerable, guarded only by skin and muscle. If a pregnant rider is kicked or thrown off her horse at this point in the pregnancy, the fetus is at high risk for serious injury. If you choose to work around or ride horses during your pregnancy, be sure to choose quiet, non-spooky horses. Even if you’ve known a horse since infancy there is no way to predict its behavior under any circumstance so BE CAREFUL! Groundwork may be an option, especially for women at high risk for pregnancy loss, or those with a family history of pregnancy complications or pre-term labor. 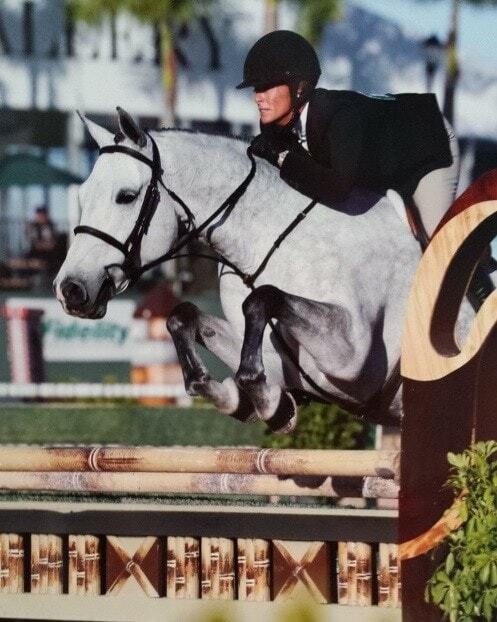 Women with any history of pregnancy loss before 24 weeks or are currently experiencing a high-risk condition should NOT ride or work around horses. 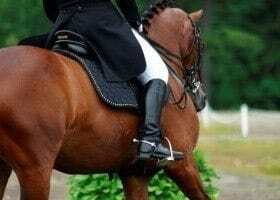 In addition, placental disruption, a serious pregnancy complication, in which the placenta separates from the uterus, is also possible due to the jostling one experiences while riding. Not surprisingly, many experienced riders, often say it’s very uncomfortable to ride during pregnancy due to balance issues and occasional nausea. Some also find that as their abdomen grows, and their physical energy diminishes, mounting and dismounting become a problem. If you do choose to ride never ride alone, by no means jump, or ride on rocky, hilly trails, to ensure the safety of you, and your unborn child. It appears the general consensus, among most physicians, is that riding is dangerous during pregnancy and should be avoided, especially after the 12th week. In the end, the decision to ride is a personal one made by you and your physician. Keeping physically active, following the recommended guidelines, and exercising safely while pregnant will guarantee you remain fit and trim, making it easier to return to your pre-pregnancy fitness level.